"Love and respect for all humanity begins when we love and respect all animals." We are currently ONLY accepting applications for folks with these qualifications, because this is where our team needs the most support right now. If you fit the bill and are interested in volunteering with an incredible group of horses and humans, please contact us! Keep an eye on our Events and our Facebook page where we will announce any upcoming new volunteer orientations. There are so many ways that our dedicated volunteers make a difference in the lives of our rescues. Whether it's getting down and dirty with farm work or assisting with community outreach and fundraising, we appreciate their willingness to give their time and their talents to further our mission. Take a look at the video below and see just a bit of what we do. "After my husband passed away, I was looking for something to occupy my time but be worthwhile, too. I was so very lucky to find this organization. Not only are the volunteers dedicated to the exhausting work it takes to keep this farm running, but the effort that is expended to get these beautiful horses back on their feet is outstanding. Our H.O.P.E. Partner Program began in 2016 and its design paired every horse on the farm with a volunteer. Together they learned trust and respect between handler and animal. 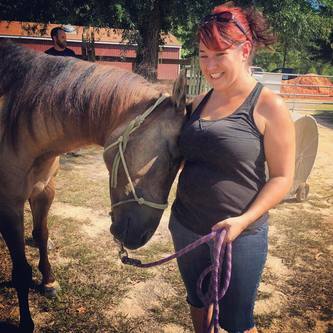 Our goal with this program was to help every horse work through mishandling and abuse and in turn educate those who help nurture them through proper handling and respect for the animal. 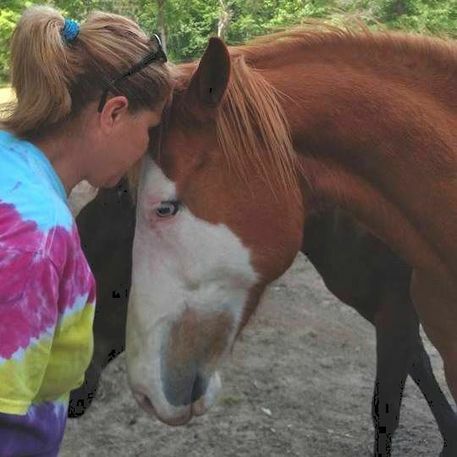 The bond we have seen form between caregiver and horse has been monumental! We are all extremely thrilled to share that throughout our 2016 Program, there were a total of 15 adoptions to forever homes! Our highest number of adoptions in one year to date! Many thanks to everyone who participated and committed their time, energy and love to make such a monumental impact in so many of our horses' lives.